My son loves Cheerios. LOVES them. But not only are they apparently yummy (I don’t quite understand the appeal myself 😉 ), they also have a fun shape that pretty much screams for putting them on a skewer. 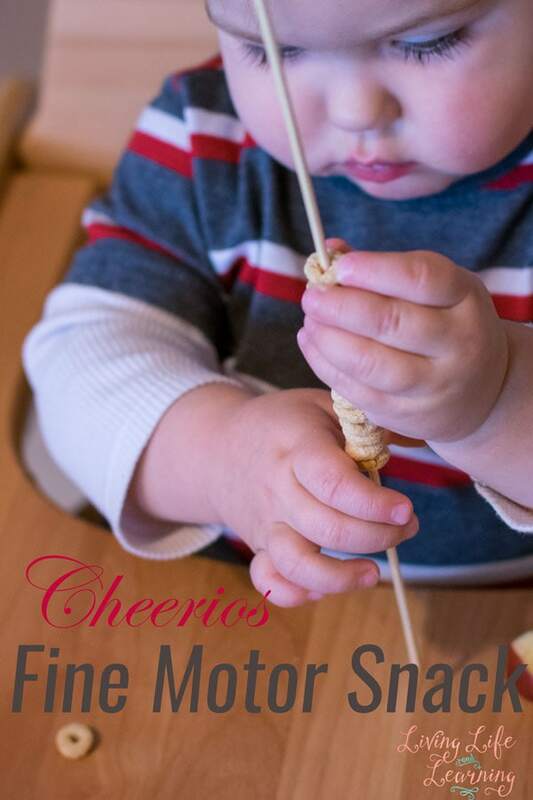 I did just that and made a Cheerios Fine Motor Snack for a fun, engaging way to work on N’s fine motor skills – and he thought it was the most amazing idea ever 🙂 It’s fine motor practice, looking at things in a new way, sensory exploration, and a snack all in one, just an all around great little activity. Cheerios or other o-shaped cereal. A skewer. Cut off the pointy end(s) if applicable. When I put the skewer with a handful of Cheerios in front of him, N was a bit taken aback. 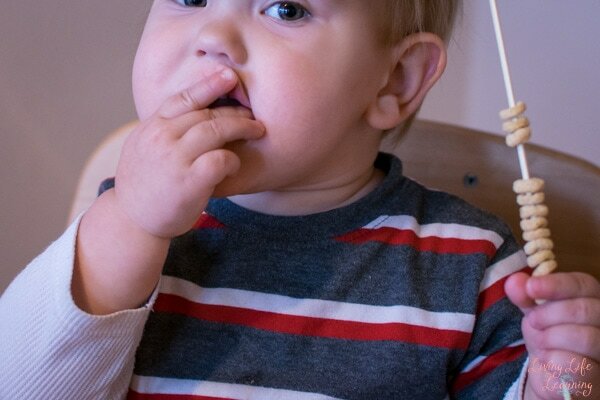 But he quickly put his apple down to figure out how to get to his beloved Cheerios. The Cheerios were a bit of a tight fit, but it didn’t take him long to get the first one off. Once the first batch of Cheerios was gone, I put another handful on N’s tray. I wasn’t sure if he was going to bother with the skewer instead of eating them right away. 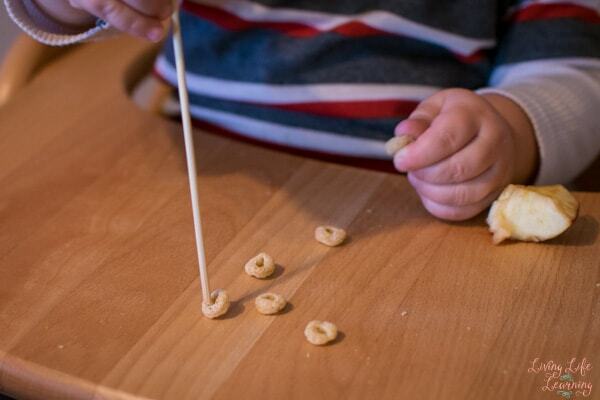 But he apparently liked the skewer so much that he decided to find out how to get Cheerios on it. At this point, he’d long since forgotten about the apple. 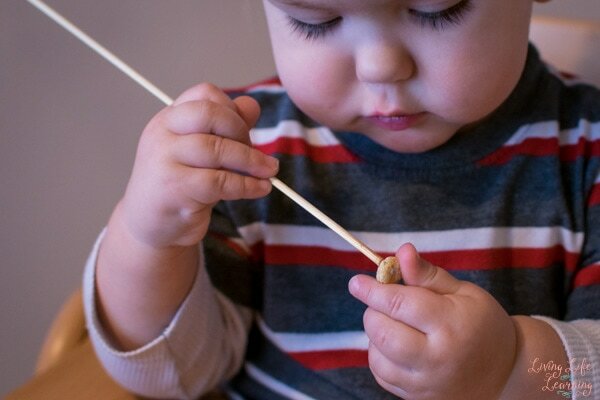 It took him a little while, but eventually, he had success and was able to eat a Cheerio right off the tip of the skewer. 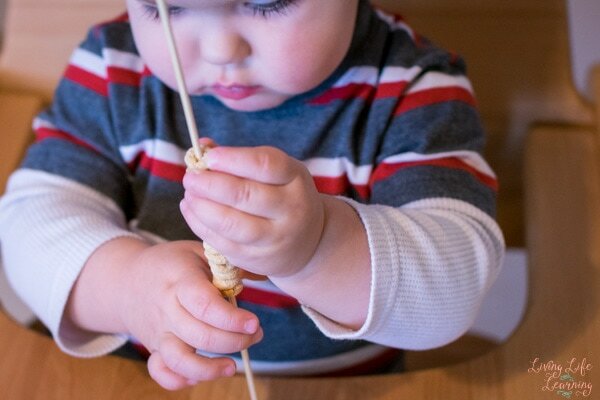 I loved the different way he experimented with the Cheerios and the skewer and didn’t give up when it took a little while to figure it out. 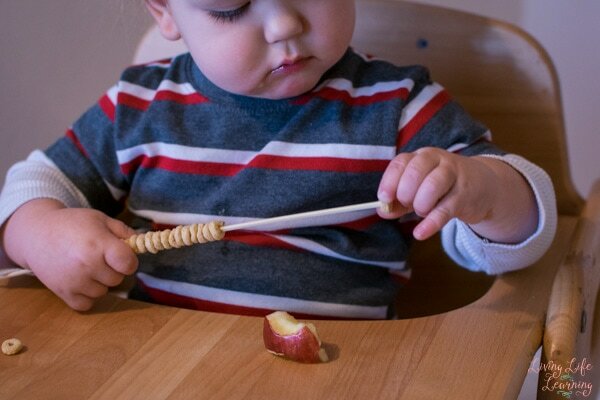 Using both hands to get a Cheerio on his skewer ended up being his favorite technique. 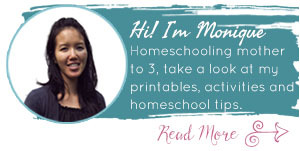 Are you looking for other simple toddler activities? Toddler Boredom Buster with Cups and Flowers. These activities are all pretty much mess-free, but if you’re up for the possibility of a little bit of a mess, try these: Sand Foam Sensory Play, Goopy Grass Sensory Play, and Sensory Play with Dinosaurs.